A while back, Marc and I took the kids on a surprise trip, and this taught me a bit about following the Lord. 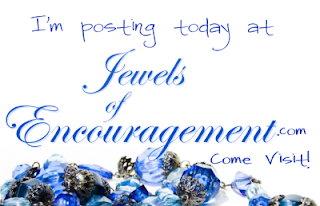 Would love to have you stop by Jewels of Encouragement today and read about "Going Out." Welcome to week nine of my dear, dear friend Patty Wysong's From A 2 Z 4 U and me. We're work through the alphabet - one letter each Tuesday. No rules, other than your post has to relate to the letter of the week. Link up at Ordinary Lives and check out everyone else's post. Click on the graphic above for more details, and stop by Patty's blog to link up. This week's letter is "I," and I decided to go along with Patty's suggestion for this particular letter. So, here at my blog, I is for "introduction" - to me, that is. is for JEWISH, the religion in which I was born and raised. It also stands for JESUS - who entered my life when I was 32, and who has controlled it ever since. And, perhaps for obvious reasons, it also stands for JOANNE. Cuz, well, that's my name (don't wear it out) ;). J also stands for JEWELERS - my heart friends that started as a way to encourage FWer challenge "enterers" and has morphed into so much more, including the OTHER blog I'm posting at today. is for OUTGOING, a word most people associate with yours truly. I am most definitely a people person. Any arguments? Hmmmmm?It's also for OLD. As in the Old Testament. Which I LOVE having a lot of knowledge of because of being raised Jewish. is for ANDREW and ANNIKA, my beautiful children. And I already wrote a post about them, so check it out if you want more info. It's also for AILING BODY, NOURISHED SOUL, the nonfiction book I'm currently pitching. is for NEW TESTAMENT. Which I've only been reading since 1998. And which gives me goosebumps just about every time I dig in. And which I see reflections of throughout the Old Testament. is for EDITING. When I was in college, I used to go around the dorms looking for papers to proofread on study breaks, because it helped me relax (TRUE STORY). It's something I truly enjoy, and that I've been told I'm good at. And now I'm doing it, at least sometimes, for income. LOVE being able to help my house financially - and I get to help writers. How awesome is that? Be sure to stop by Ordinary Lives for more A2Z4UandMe posts. Loved your post! Love the graphics too. Wonderful acrostic! WHen I read it, I thought the same thing Patty said, it fit your fantastic personality! Love you! Oh, Acrostic is a cute idea! (mine would have been awfully short, tho!) Loved the post. Cute idea and the graphics just made it! Those dancing graphics just suit ya :) I didn't know you were editing as well - super cool. I'm with you on the 'outgoing' part. Me, too! I always enjoy reading - and looking at - your creative posts, Joanne. My mother does acrostics for many of her Bible studies. Your special alphabet would really had some spark to hers. What a great acrostic and insight into who Joanne is. I especially love the looking for things to edit note!